Only half an hour from the hustle and bustle of St Georges, Mango Palma is an ideal country retreat for those wanting relaxation, comfort and an authentic experience of Grenada. 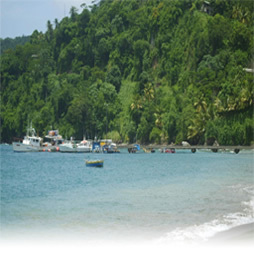 Situated within the Parish of St John’s on the West Coast, not far from Concord Water Falls, the fishing village of Gouyave and five minutes’ walk from Palmiste Beach, Mango Palma is centrally located and provides a perfect base for exploration of the entire Island and for a 'Fish Friday' weekend escape. Commanding a spectacular sea view, Mango Palma offers tranquility and the opportunity to unwind, relax and be rejuvenated. All rooms within each of the three apartments are extremely spacious, comfortable and tastefully furnished to high standards making your stay a truly home from home experience. Mango Palma has the capacity to accommodate large groups and it is an ideal venue for family reunions, bridal parties, training events and retreats. Mango Palma is best suited to independent holiday makers wanting a diverse, relaxed and authentic taste of Grenada. Mango Palma is licensed and approved by the Grenada Board of Tourism. Affectionately known as "The Isle of Spice", visitors will be captivated by the aroma of nutmeg, cinnamon, clove and ginger, mixed with the smell of seasonal fruits such as mango, grapefruit and papaya. That, along with the sea and mountain breezes makes an unforgettable and intoxicating concoction. Grenada offers its visitors a multitude of experiences such as hiking though rain forests, sailing, diving, or just sheer rest and relaxation…Grenada is the perfect chill out zone. Our comfortable, yet affordable one bedroom Garden Apartment enjoys easy access to the large garden and fruit trees. The Garden Apartment also boasts a grand sea view. The bedroom has a queen-sized bed, and built in furniture. Our spacious two bed roomed deluxe Plum Tree Apartment sleeps 4 and has its own verandah, an extremely large open plan kitchen/dining/living room and two exceptionally spacious and bright bedrooms, each with a double bed and built in furniture. We are proud of our three bed roomed split level Ocean View Apartment, which sleeps 6. This luxuriously appointed apartment comprises of three double bedrooms.